WBC ATLANTA AND SPIDERS’ WEBS - Marco Beverage Systems Ltd. I should really be doing something else… But it would be untoward of me to let the dust settle on Atlanta 2009 without recounting Über Project’s version of events. Through years of a spider’s web of connections, introductions, fun and coffee, I have met some fine fine people – these connections and learnings led to the Über Boiler’s first existence. These same connections led to Cindy of Counter Culture Coffee (now Executive Director of WBC – Woooooo) inviting the Über Boiler to the inspired new concept of the WBC Brew Bar. The 2009 Irish National Barista Championships and my desire to begin the ÜberProject led me to Ireland’s finest Coffeeblogger David Walsh of theotherblackstuff.ie. David has been the technobrains enabling me to breathe life into the Überblog and Twitterland. Thanks David! A certain Mr. Morrissey introduced me to Doug Zell and that’s how an Über ended up on Intelligentsia’s stand. Über and Chemex. Check. Excellent Barista. Check. The WBC Brew Bar was a seriously incredible concept. For brewed coffee to at last share a stage with espresso, the little bully, was astounding. I honestly worried that three espresso-based stations would enjoy hungry queues, while Über lay lonely. I fretted that baristi would be beating each other up to deliver shots, capps and sigs while the Brew Bar would be the last guy on the team to be picked. What a pleasant surprise. The brew bar attracted both astounding baristi on one side and a steady flow of customers on the other. I want to thank the excellent collection of talented men and women who produced great coffee from the Über over the 3 days. I will post a list of all concerned later. I am so chuffed that Brian (top man) at Counter Culture Coffee agreed to take the Über Boiler to CCC for assessment and feedback. Huge thanks also to the excellent Terry and Michael of Espresso Parts for helping set up the WBC Bar. 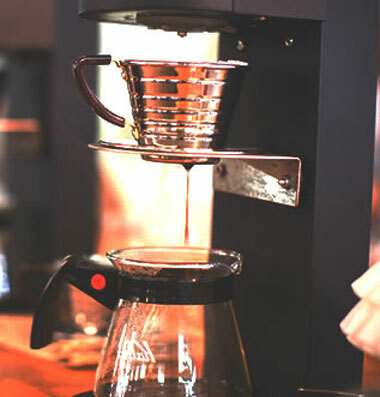 I was also honoured to have our machine featured on Intelligentsia’s Booth at the SCAA. Intelli’s fine fine coffee made with Über Boiler makes me smirk like a small child complimented by a favoured uncle. I look forward to their feedback with equal excited expectation. The invite to present Über in Atlanta allowed me to witness and pay tribute to two of the many stars of Atlanta ’09 – Ben Helfen of the beloved Octane and Colin Harmon, representing Ireland to reach the dizzying heights of 4th in the WBC, with only the immense trio of Gwylim Davies, Sammy Piccolo and Mike Philips ahead of him. Dizzying heights indeed. Stars of Atlanta - Ben@Octane. Colin and Gwilym. I wish only good wishes to all those wonderful baristi I have met over the last week. The Atlanta experience and the enthusiasm and energy whipped up by the barista community is inspiring. Well done to all who had a hand in organizing Atlanta. Met a ton of nice people, too many to mention. Congratulations to Stephen Morrissey for being a wonderful ambassador for both coffee and Ireland during his reign, and to Gwilym Davies who will no doubt represent both coffee and Wales with equal aplomb. It was, in the vernacular of Atlanta, AWESOME.